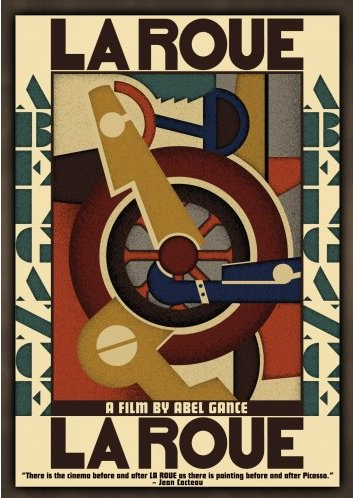 A very exciting 2-disc DVD has just been released: La Roue (1927), a monumental silent directed by Abel Gance. I saw this film on the big screen and at that time it ran at four hours, but this new restoration seems to come in even longer at four and a half. It revolves around a steam train engineer and the infant girl he saves from a train wreck, evolving into a complex and delicate drama. While containing some devastating and kinetic imagery, particularly around steam engines, it ultimately is one of the most memorable silent film experiences out there. Finally I get to see it again. Directed by Abel Gance whose Napoleon (1927) is legendary, this is highly recommended. It is published by Flicker Alley, who has emerged as a great new distributor of rare silents on DVD. Check it out at their website. I love this poster. And the film is terrific of course..